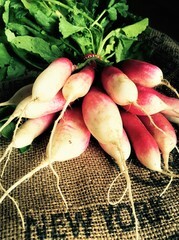 This is just a reminder that today, Wednesday June 21st is a CSA share pick-up. Your share will be ready for you to pick up at your chosen pick-up location between 4-7 pm. We are excited about this week's harvest. Tuesday beckoned in the summer solstice here in Colorado. The longer and warmer days have the field hinting at a bounty of beautiful produce as tender buds push through the soil and unidentifiable green fruits form on various plants throughout the farm just waiting to burst into vibrant colors. But before we rush ahead to anticipating the rewards that await us at the end of our long hot summer, we are busy wrapping up the last few gifts that this beautiful wet spring has left us. The time has come to officially bid goodbye to the final reminders of the chilly winter and spring as we harvest the last bunches of tender carrots and delicate flowers from the intense heat of the hoop houses. Our orderly rows of deep red, bright green, and speckled head lettuce will quickly disappear from our field to your table over the next week as we turn over the soil to plant a new crop that basks in the heat of the bright sunshine. The peas are having their moment and continue to remind us how the sweetest things may very well come in small packages, or in this case pods. The snap peas are juicy and flavorful, while the snow peas are tender and delicious. English shelling peas are on their way as well and the fava beans are tempting us to pick them, but we will be patient. While the farm is a constant reminder of growth, this time in particular feels especially poignant as everything is thriving and on the precipice of plentitude. The radishes and beets are nearly ready to be picked, the garlic and onions continue to expand hidden underneath the soil, the potatoes leaves are bursting upwards, the tomato, squash and pepper plants are standing tall. Along with the crops, the interns are growing just as fast. 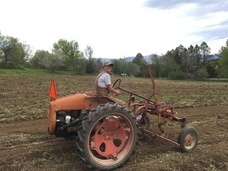 On any given day you may spot a group of eager young farmers harvesting, working on irrigation, tending to the livestock, or driving a tractor down Valmont en route to one of our fields (don't forget to wave!!). This group has embraced the spirit of a hands on education in the field and their incredible attitudes continue to inspire the mission of the farm to bring delicious food to our community. We are certain that the summer will be sunny and the future bright. Massage kale with olive oil and 1/2 teaspoon salt in a large bowl, coating all surfaces, about 2 minutes. Let stand at room temperature at least 15 minutes and up to 1 hour. Rinse onion in a sieve under warm water for 2 minutes. Drain well. Combine onion, sumac (if desired), and sesame seeds in a small bowl. Combine juice, mustard, and garlic in a small bowl. Add juice mixture and chickpeas to softened kale; toss well. Stir in remaining 1/4 teaspoon salt and pepper. Top with onion mixture. Whisk lemon juice, olive oil, apple cider vinegar, nutritional yeast, oregano, and basil together in a large bowl. Add carrots, kale, quinoa, and sunflower seeds; toss to combine. Toss sugar snap peas and olive oil together in a bowl; spread in an even layer on prepared baking sheet. Bake in the preheated oven until tender but still crisp and beginning to brown, about 2 minutes. Sprinkle with chives and salt. Coming next week... head lettuce, carrots, greens, snow peas, garlic scapes and more. Coffee share - next week! Bread share - next week! Wine & cheese - next week! We are really excited to be working with Hatch Lab this season to bring you two awesome classes at the farm store. Grab your kiddos (8 and older) and learn to ferment as a family. Hatch Lab and Cure Organic Farm present Family Fermentation with Mara and Willow King of Ozuké. Join us for an afternoon of learning, tasting, knife-skills practicing, and curiosity piquing while we work with seasonal, organic veggies gathered from the farm. Mara and Willow will teach you about the science behind fermentation, and you'll learn to craft creative concoctions on your own. Each family will leave with two jars of fermented goodness to enjoy at home. Please note that this workshop is not appropriate for children younger than 8 years old. Limited to 14 total participants to ensure an intimate experience. Hatch Lab and Cure Organic Farm present Farm-Fresh Botanical Dyeing in partnership with Edie Ure and Ozuké in Boulder, Colorado. Spend the day at Cure Organic Farm with natural dyeing expert Edie Ure. Learn about the colorful world of natural-dye plants and create your own masterpieces using pigment-rich flowers, veggies, and trees from Cure Organic Farm. We’ll all gather botanicals from the farm so you can custom dye a set of cocktail napkins to take home. We’ll enjoy coffee, tea, and fresh fruit in the morning and a scrumptious lunch prepared by fabulous fermenters Mara and Willow King of Ozuké. Each participant will go home with a special gift for the aspiring natural dyer. of greif. I come into the presence of still water. Place the garlic, ginger, salt, cayenne, Tamari and sesame oil in a small bowl. Whisk until well blended and set aside. Heat a large frying-pan over high heat. Add the peanut or grapeseed oil, turnips and mushrooms. Sauté for 7 to 8 minutes until the mushrooms and turnips are golden-brown, tossing only from time to time. Reduce heat to medium. Drizzle with the ginger-soy mixture. Quickly toss and sauté for only 15 seconds. Transfer mushrooms to a large bowl and cool until slightly warm to the touch. When ready to serve, add the scallions and peanuts to the mushroom and turnip mixture. Drizzle with the lime juice and stir until well blended. Spoon about 2 tablespoons’ worth of the mixture into each lettuce leaf.